Your heart is magical. Absolutely magical. Not just the part about it keeping you alive, although that is pretty amazing. This new information about the heart is mind blowing. When I heard that the human heart can express emotion without language I wanted to know something more. It turns out the ‘something’ I was looking for was found in the ‘nothing’. There are brilliant experiments done by the HeartMath Institution in California that dive deeply into the workings of the human heart. Within our heart beat there exists a pause – a moment of seeming nothingness between beats. This moment is called the interstitial beat. This was previously thought of as just a pause, but HeartMath has discovered that this moment carries information about our emotions. They can tell via the pause between beats what emotion we’re feeling. Your heart speaks in the language of emotions. It’s no wonder then, that anger and other such negative emotions overtime can cause heart issues. Possibly even more amazing, they applied this information to relationships between people. The human heart produces a large electromagnetic field that radiates outside the body carrying information. If you’re standing near to someone, you’re standing in the field of their heart and your brain recognizes and responds to the information in that field. Basically, your heart can communicate with someone else’s brain without words. Talk about connection! Could the heart then be responsible for what we know as intuition? That inner knowing of information without being told? What about future events, can the heart predict those? Would you believe it if the answer was yes? Well… yes! Electrophysiological evidence has been found showing “that the heart is directly involved in the processing of information about a future emotional stimulus seconds before the body actually experiences the stimulus.” (source: http://www.heartmath.org/) Your heart is the first part of the body that responds to something before it happens. I love this idea, particularly in reference to information we have about the heart chakra. Your heart chakra is the chakra that connects everything spirit (top 3 chakras) to everything human (bottom 3 chakras). It channels both spirit and human information. So knowing that it gets information before our body does, to me, this confirms the pure connection your heart has with spirit. How can you tap into this connection? HeartMath shows that the connection is instinctual; it already happens seconds before you need to know something. So what you’re really looking to do is slow down those seconds and understand the information being given to you. Mindfulness is a wonderful practice for this. Grab a bolsterand lay on top with your spine down the length of it. Move your arms out to the sides with your palms up and start to relax completely. This position alone is opening your chest, which in turn will begin to open your heart. Begin to watch and feel your breath – one breath at a time. Notice the small details like the pause in-between your exhale and inhale. The cold air as it comes in and the warmth as it moves out. Begin to notice your heart beat and it’s pause between beats. Get to know your breath and heart beat in a calm moment, and then get to know them in a not so calm moment. Once you’re more familiar with them, you’ll begin to see when you’re tightening your breath and when your heart might change for what seems to be no apparent reason. You’ll also begin to see other signs that go along with it; Are you making a fist? Clenching your teeth? Flexing your tongue? Squeezing your buttocks? Holding your breath? Even if it’s subtle, it’s something. You can’t go wrong when you’re listening to your heart. 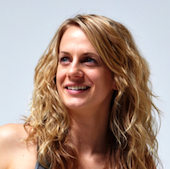 Donna Wilding is a teacher and student of yoga for 10+ years, and a student of life for 32. She’s happy to say she survives in the city of Toronto by sharing her passion for Yoga and Reiki. You can find her on Twitter.